After a week of posturing, the two chief negotiators meet privately with a deadline for a deal about three weeks away. WASHINGTON — President Barack Obama and House Speaker John Boehner met at the White House to discuss the “fiscal cliff,” while rank-and-file Republicans stepped forward with what they called pragmatic ideas to break the stalemate. 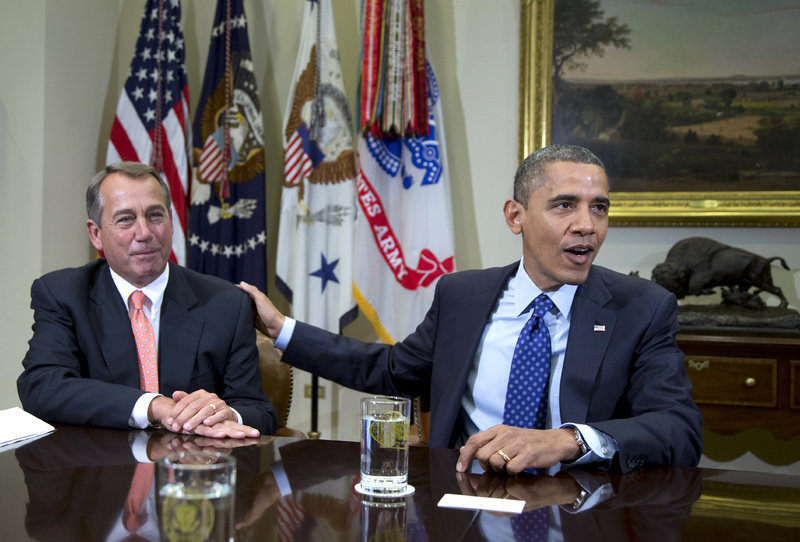 The Obama-Boehner meeting Sunday was the first between just the two leaders since Election Day. They agreed not to release details of their weekend conversation, but aides emphasized that the lines of communication remain open. Seeking to rally popular support for his position, Obama was heading to Michigan on Monday to speak to auto workers at a plant outside Detroit. It’s the latest in a string of campaign-style appearances Obama has held in recent weeks echoing a theme he stressed repeatedly during his campaign: that the richest Americans should pay more to help reduce the deficit. At the same time, GOP mavericks are putting increased pressure on their party’s leaders to rethink how they approach negotiations with Obama in the wake of a bruising national election that left Democrats in charge of the White House and Senate. Conservative stalwart Sen. Tom Coburn of Oklahoma had already floated a similar idea, and Rep. Tom Cole, R-Okla., has said Obama and Boehner could at least agree not to raise tax rates on the majority of Americans and negotiate the rates of top earners later. But such ideas face an uphill battle. Many House Republicans say they wouldn’t vote for tax rate hikes under any circumstances. And GOP leadership could lose leverage in the negotiations if it raises the rate on upper-income earners without getting anything substantial in return like entitlement reform. Democratic leaders have suggested they are unwilling to tackle entitlement spending in the three weeks left before the fiscal cliff is triggered. “We need to address that in a thoughtful way through the committee structure after the first of the year,” Durbin added. The “fiscal cliff” refers to rate increases that would affect every worker who pays federal taxes, as well as spending cuts that would begin to bite defense and domestic programs alike. Economists say the combination carries the risk of a new recession, at a time the economy is still struggling to recover fully from the worst slowdown in decades. Obama’s plan would raise $1.6 trillion in revenue over 10 years, partly by letting decade-old tax cuts on the country’s highest earners expire at the end of the year. He would continue those Bush-era tax cuts for everyone except individuals earning more than $200,000 and couples making more than $250,000. The highest rates on top-paid Americans would rise from 33 percent and 35 percent to 36 percent and 39.6 percent, respectively. Boehner has offered $800 billion in new revenues to be raised by reducing or eliminating unspecified tax breaks on upper-income earners. The Republican plan also would cut spending by $1.4 trillion, including by trimming annual increases in Social Security payments and raising the eligibility age for Medicare from 65 to 67.